A NASA Pluto probe may be slumberingat the moment, but it'sstill tearing through space at a blistering pace, closing in on theorbit ofUranus. The New Horizons probe is the fastestspacecraft everlaunched from Earth, having sped from its home planet in 2006 at about36,000mph (nearly 58,000 kph). 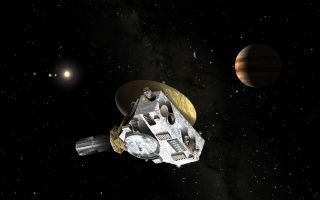 It had covered half the distance of its nearly3 billion-mile(4.8 billion-kilometers) voyage bylast February, and the spacecraft should reach Pluto in July2015. Currently, New Horizons is about 18.5times farther fromthe sun than the Earth is, and it should pass the orbit of Uranus inMarch 2011,NASA officials said. The spacecraft is flying to studyPluto and its three knownmoons ? Nix, Hydra and Charon. In recent years, anumber of revelations have come out regarding Pluto from the HubbleSpaceTelescope, such as the discovery of NixandHydra, as well as apparent geyser eruptionsand seasonalcolor changes on thedwarf planet. "Thesediscoveries havehelped develop our encounter with Pluto, which is now fully planned," said New Horizons principalinvestigator Alan Stern of theSouthwest Research Institute in Boulder, Colo. "Wehave a list of things of do, which has been converted into a timelineofevents, which has been converted into spacecraft software with all thecommandsto run the spacecraft and instruments." New Horizons "is verydifferent from most missions in the solar system today," Stern told SPACE.com. "It'slike we're back at the early days of planetary exploration." Dozensof missions have been sentto Mars and the moon, and multiple spacecraft have checked out Venus,Jupiter,Mercury and Saturn, as well as various comets and asteroids. Butfaraway Plutohas escaped such attention thus far, Stern said, as has itsneighborhood, theKuiper Belt ? thering of icy bodies beyondNeptune's orbit. "WithNew Horizons, this isour first reconnaissance of Pluto, of this kind of world ? we've neversent amission to the dwarf planets before, never sent a mission to the KuiperBelt," Stern said. "This is the first time we're going to see a newtype of planet since the '70s, when we had our first mission to a giantplanet,Jupiter." Plutoand the Kuiper Belt remainmysterious in many ways, and New Horizons should help fill in somemajor gaps, Sternsaid. "Sowe don't have a narrowscope here ? we're going to write the book on Plutoand the dwarf planets,"he said. "We'rehere to map Pluto, map its surface composition, measure its atmosphericcomposition, pressure and temperature and assay the same kinds ofmeasurementsfor all of its satellites." NewHorizons is hibernating now,as it does for most of the year. It wakes up for about two months eachsummerto test its systems, calibrate its instruments and gather tracking dataneededto make course corrections as necessary, Stern said. Thespacecraft also rouses itselffor about 10 days in both November and January to do more tracking andmaintenance activities. So far, everything has checked out fine. "NewHorizons ishealthy," Stern said. "All systems and instruments are working well,and we have never had a case where we've had to use a backup systemowing to aproblem. We have good fuel reserves, too, and we're bang on course toPluto." After it reaches Pluto, New Horizonswill not stop itsflight to orbit the dwarf planet. Instead, after its flyby, it willdash outinto the Kuiper Belt to investigate the icy bodies lurking in thatmysteriousrealm. The NewHorizons team has not yetchosen which Kuiper Belt object they might visit after Pluto. The search for candidates will startnext year, Stern said.Scientists will use giant Earth-based telescopes to pick out flybytargetsbeyond Pluto, to be reached in the late 2010s and early 2020s. "I want to know as much about whatcandidates are outthere and as much about the candidates as possible before making thebestpossible decision," Stern said. "Making a decision too early would belike picking fruit that's not ripe yet."